Hello everybody just looking for a little advice. Toby is now 10 months and he is very handsome but his ears still seem to be a little 'floppy'. If I ever wanted to show him would this be an issue? My Tess had one ear that had a break. Lilly's ears are small, thick, with a forward tilt. Your chow's ears look like Lilly's. Reminds me of a bear's ears. Both beautiful chow girls. Your chowling is beautiful too. "Small, moderately thick, triangular in shape with a slight rounding at the tip, carried stiffly erect but with a slight forward tilt. Placed wide apart with the inner corner on top of the skull. An ear which flops as the dog moves is very undesirable." Based on the photos they look a bit forward, but i wouldnt call them floppy. Larger chow pups tend to have the ears come into standard a bit later, but your pups don't look like a disqualifying issue. Of course it varies by location and judge. My male, Rory has a bite issue in his lower incisor, but is otherwise to breed standard. Some judges don't mind it at all, others feel it is enough to not give him pts. Take the time to check out some shows locally. Most handlers are pretty open to assessing the breed quality. You might even be able to speak with the judge and get a quick opinion. 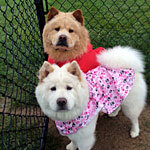 Your Chow Chows looks beautiful whatever her ears! I am just so in love with this little man!! I thought that I might add to this discussion....anything other than a black nose is a disqualification, which is why you rarely see cream chows in the ring. I thought about showing my cream, but her nose was turning at 8 weeks. Beautiful boy!